Repair A Flat Screen LCD TV With Power Issues – Power Board? How to repair an LCD flat screen TV that won’t turn on? I have a 55″ inch flat screen TV that is not working properly and would like to repair it. The TV works but I think maybe a board or a cap inside is bad. Can you give me some advice as to what may be the issue? I will explain what I have found so far. TV has power and it stays on standby just fine, the red light turns on when plugged in but no turned ON. Once turned ON, the light turns orange for a few seconds and then it goes to the ON green light. Sometimes it starts going only to orange but then back to the standby red light. The TV will work but only after turning it ON and OFF like 15 to 40 times. Do you think the power board or power supply is going bad therefore the TV will not turn on properly? Any help is appreciated. We have seen many large flat screen TVs do this. It is usually one or more bad capacitors on the power board. A cap is a few bucks and easy to replace if you can desolder and solder. You need to identify the bad capacitor. The bad cap will look buldged out or extra fat and deformed. The small cross on the top of the cap usually splits when they go bad. Find the bad cap and replace it. UNPLUG THE TV FIRST… Then open the TV case carefully and gently. Gain access to the inside of the TV so you can see all the boards inside. Look at the capacitors on the power board for any signs of buldging. If you see no buldging caps then you may need to just replace the complete power board which are not expensive. At times, caps don’t always bulge out & you cannot measure capacitance with a regular volt meter. You COULD order all the electrolytic capacitors you need for the TV power board. This would be time consuming and might not even work. A new power board would make the most sense. Need to find a special part for your LCD or LED flat screen TV? 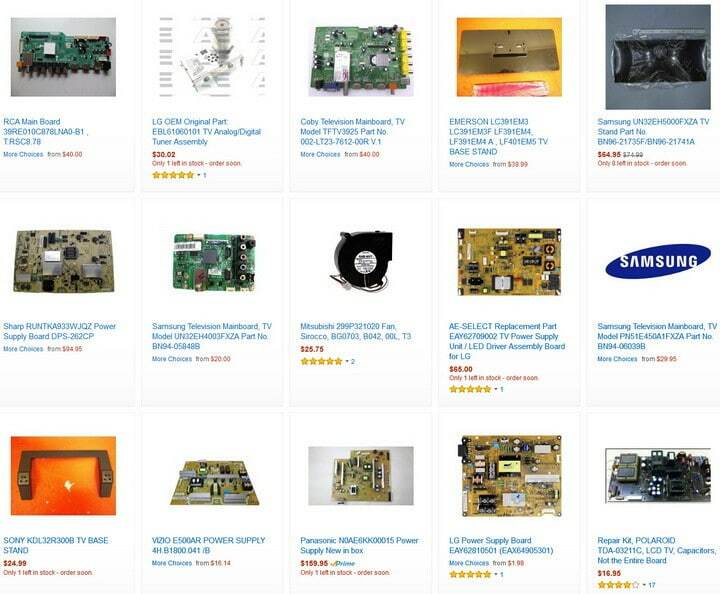 Here is a Parts Store for LCD TV Parts. TV Power Supply: The power board converts the ac line voltage which is 110 volts AC to lower voltages that are required for the operation of the television, very important is the stand by 5 volts needed by the microprocessor to stay wake so when it receives a command such as power on to turn on the power supply, then the power supply generates the secondary voltages needed which can vary by television, some are 12 to 18 volts needed by the audio circuit and 24 volts supply to the inverter board and numerous other voltages. Need to know for sure if your power supply board is faulty before buying a replacement? Do you know of easier ways to diagnose and fix an LCD LED TV with power issues? Please leave a comment below. Toshiba Model50L 2300A.Power board showing constant 5v output.Assume it’s OK.Tried reset via unplug,re plug after 2min interval.Stand by light glowing.Manual side off/on no effect. Suggested channel up method also.No remote but should power on.Any thoughts before I tell them to purchase another? Samsung 40 inch 1080 flat screen , picture shuts off sound remains. This happens about every hour. I have a hisense TV 58K321uw, it has no standby and is completely dead. Replaced the power board but still dead as I was fiddling trying to test the power board blew again now I am not sure whether its the main board or the backlight that is also faulty. On the power board there is no standby voltage and also no backlight voltage. Now as I am trying to test do I bridge the the power on with ground or a voltage? Before you do anything else, try a different cord. I’ve had 2 different Panasonic TV’s that wouldn’t power on after power interruptions/surges. Each time, 3 on the same TV, I simply replaced the detachable power cord and the TV works. Not sure why, because the cord which won’t work on the TV anymore will work with other devices like computers and such. Weird, I know. Visited my son and saw that he had his TV apart and was trying to figure out why it wouldn’t turn on. I supplied him with a new cord to try, and that fixed it. I had a Samsung tv that would just turn off and on constantly. I took it apart and disconnected a sensor bar that controlled power, volume and channels. This solved my issue for a while but then it began to have the same issue. Starting doing some research on Google and came across this article so I figured I’d give it a try. Ordered a power board on eBay for $35 and so far it works. Hope this helps someone else some dollars. TV will not power on the capacitors are all good, any suggestions? I have a Samsung UN55D8000 LCD TV that will not turn on and is making a clicking sound. I replaced the power board. I have Sony TV 46HX750 which shows 3 standby blinks and the screen does not turn on. It stopped working when there was a lightning strike nearby. I checked Power board and it seems to send standby voltage 3.3V to main board. I purchased in 2013 a Samsung 46 inch LED HDTV; S/N z4nf3cxd103278v; model un46eh6000. It does not turn on – no power. If I try remote off and on, I can see faintly the red light go on and off. It is plugged in my power strip which is working. For a quick check, plug the Samsung TV into another outlet to be sure your power strip is not the issue. I have a Sony LCD TV KDL 52v4100 it was flashing the code that it needed a new power board so I ordered 1,. Put it in and nothing. So assuming it was the power board I ordered, I sent it back and put the old one back In. It gave me the flashes again so I ordered another power board and put it in and again nothing. I checked all the capacitors they all look good on the new board and the old one. So now can anyone give me an idea of what else may be wrong? No picture, backlights function, and I have sound. When I test all voltages on the output pins leading to the main board (from the power supply board) the 24v line only reads 3v. So I’m assuming this will prevent my main board from being able to operate. I couldn’t see any visual damage on the power board. I have a Samsung PS51E6500 – It had vertical lines which looked a bit like 2 or 3 rows of dead pixels. One day, mid watch, the line became thick and black and then thin again, but now a multicolour, seeming to have movement up and down. PICTURE TOTALLY DISAPPEARED Sound not affected, Turning on/off at turn on the screen grey colour seems to get lighter. Seems to indicate power board – If I got one is it a task for a layperson with a suitable instruction video? I have a 49″ Insignia 1080p 120 Hz TV that I bought two years ago. The red power light turns on when plugged in but the TV itself will not respond when the power button on the TV is pressed or the remote power button is pressed. Do you possibly know what might be causing this or how to fix it? I have a Samsung plasma 61″ it turns on I have sound just no picture. I’ve checked capacitors don’t seem to be damaged. Can tv power supply boards exhibiting scorch marks under the transistors connected to a heat sink be repaired by just replacing the blown caps and transistor that went bad or will the entire board need to be replaced? This is a Samsung which made a pop noise and now just clicks when one tries to turn it on. I have an LG 42 TV LB5600 and lightning struck near the house and the TV will not power ON. Nothing is burnt on the boards and the cord works. I have no meter to check the voltage but should i just replace the power supply board? It would be BEST to check with a Multi-Meter to find out first… but if you are unable, then the most likely board to fry from a lightning strike in your TV is the main power supply board as that is the first board in the TV to receive power. So that is the best guess but may NOT be the issue. Use a meter to be absolutely sure. Try changing the detachable power cord. Has worked for me many times. Weird, I know, but, for some reason, the power cords are sensitive to power interruptions and will not work after a triggering event. I own a sony klv-26s400a series LCD tv. Recently my tv was not switching on, so thought of checking it. I have doubt on power supply and need some inputs on testing the power supply. I see that the fuse was blown and pcb near one of the switching transistor is dark, i am suspecting the switching transistor. My question is after replacing the transistor how do i test it, I have only the power supply board and outputs connection to the other pcb are removed. 2) can we see the output voltage at the connector without connecting the load. 3) is standby voltage 3,3 v is always available irrespective of power on switch. 4) there is pins saying power on do we need to short this pins to get the output voltage. 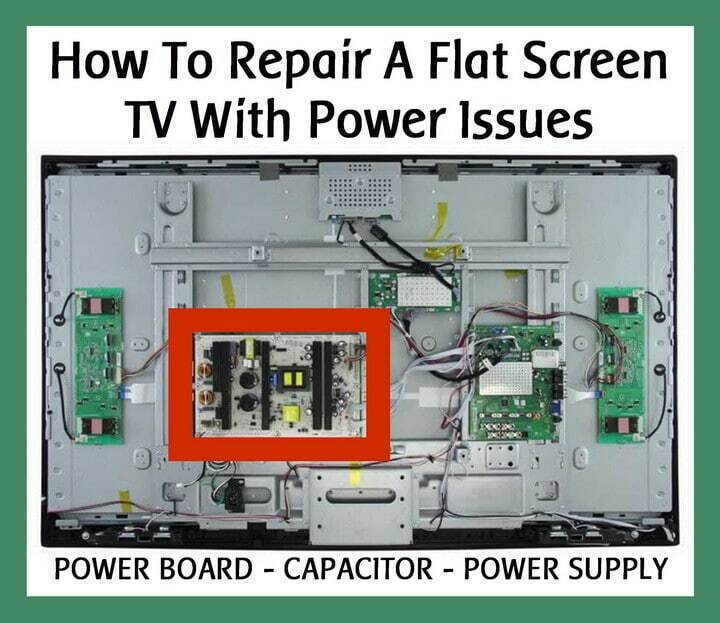 Thanks for posting how to fix a flat screen TV with power issues. I should look back at this list of things that I should check for if my TV has a bad capacitor. Looking for a cap that bulging and deformed seems like a good way to find out the condition of the capacitors. I’ll also check for a split cap when looking at my TV before telling a repair contractor what the problem is. My TV POPPED and went blank, and then wouldn’t turn back on. Everything I read online suggested the power board. I just changed it and it still won’t turn on. No red light, no nothing. Any ideas? What is the make and model of your TV? Let us know and we can give you more info about what part to replace. When you say your TV POPPED, did you smell any electrical smell? Do you see any burnt residue on the inside of the T? Have you checked all the caps on the boards? Usually a POP is a cap popping in the TV on a circuit board. It just made a noise. No smell, or smoke. No signs of anything burnt inside. I ordered and installed a power supply board (715G5778-P02-000-002M) that matched the TV, but the TV still won’t turn on. No standby light or anything. I’ve used a multimeter to check the connector and it is getting all the right voltages when it is plugged in. If you replaced the power supply board and the TV will still not turn ON, have you inspected the ribbon cables to be sure they did not get pinched, damaged, or burnt when the TV popped? Check all the other board to be sure of no damage or loose ribbon cables. It has to be something besides the main power board obviously, so check everything once over and let us know what you find. I have a 60 inch LCD flat screen tv. When the power is on, the light turns green for a second, make a clicking sound and then turns back to red. I am not sure as to what could be the problem and how to diagnose the problem. Sounds like a power board issue. You may want to take the TV apart safely and check the power supply board. Might be a bad cap or something else is fried. I have an Emerson flat screen it is 55 inches model number is lc501em3 the serial number is DS1A1232115092. My red sleep light does not turn on. Power button does not turn on the TV. When you plug the TV in it makes the sound of powering up if there is no power to the buttons and no power to the screen. The fuses not blown and none of the capacitors appear to be blown either. I do not know what is wrong with it. Any feedback you can give me would be greatly appreciated. From what you have described about your Emerson TV, we would guess the power board has failed. Do some further troubleshooting to be sure, but from the description of your problem, it sounds like a bad power circuit board. I have a vp322hdtv10a and I have changed the power cord and it is plugged straight in to the wall. I don’t want to pay 60 for a new power board. Which I’m sure that it has something to deal with and not the main board. Sould I replace the cap first just in case sense it is only $8? You can try replacing the cap… but is the cap visually bulged or look deformed in any way? Try that first and if that does not fix your issue then buying a new power board or main board may be the next step. What exactly is the issue with the TV? Yes I just took it apart today and there is four that is bulged. Well here’s the thing I was driven down the road and there was this TV and a projection TV with a sign that said big one works little one don’t when I got then home it was the opposite and the it worked fine for like a day and half then the Vizio light would stay on orange and click on and of the then it just completely went off no light or anything. I have a 46 inch LED Samsung flat screen that just started clicking constantly when the power was turned on, but the TV will not turn on. I have looked online to see if others have had this problem and from what I have read, it appears to be a capacitor problem. I called about replacing the capacitor and was told it would cost $175. Then I read about replacing the power supply board which seems to be less expensive and easy to do myself. It is a model code LN46A550P3FXZA, serial #ALXK3CPQ507347V. Any help will be appreciated. If you suspect a bad cap in your Samsung TV is causing the NOT POWERING ON issue, then replacing the power supply board is the easiest way to fix the issue. If you have made sure the cord is secure to the TV and it IS getting power but the TV will not turn ON, then you most likely have a power board that is faulty. This could be because a simple small cap has popped on the board. 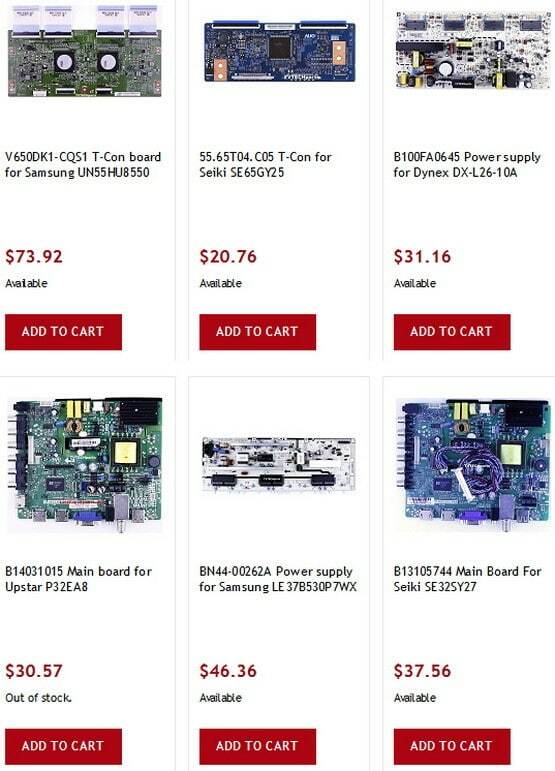 Buy a new power supply board for your TV and that SHOULD fix your Samsung TV. If you need more assistance please let us know. I have a Samsung 50 inch, model no: PN51E535A3F. The TV was blown during a storm in a power outage. There was no sign of damage on the power board but I replaced it anyway. The TV still won’t turn on, what step should I take next? Have you made sure the breaker is on since you had a power outage? Do you have the TV plugged into a power strip? Power strip is ON? Cord is not damaged? If the obvious has been checked, you may have a bad ribbon cable in the TV or a popped cap on one of the other boards. Have you checked? My samsung 28 inch led got issues with smps in which oscillator is fused. The service center guy told that oscillator is not available in market and the full board needs to be replaced and it will cost 6K. Do u suggest any alternatives? Have you checked this website for the Samsung TV Oscillator? According to the parts list it is available and is under 10 US dollars. Hello I am having a problem with my Apex TV le4643t. It will turn on with no problems sometime and then if i turn it off it will not come back on I have unplugged it lots of times to get the TV to turn back on. I am just trying to figure out if its the main board or the power supply board The only light that comes on is a blue light when it is on. The issue you are describing with your Apex TV sounds like the power supply board is on the fritz. Have you inspected the TV to see if the power cord may be bad, or where it connects? Try another electrical cord, plug in to another outlet. If the cord is not the issue, then the power supply is the most likely issue causing your problem. Troubleshoot further before replacing. I have a dynex 55″ that will randomly shut off and sometimes you can turn it right back on and sometimes it shuts off multiple times. Be sure your power cable is plugged into the TV and wall socket securly. Replace the power cable if needed. You can get them in any store that electronics are sold or online. Do not plug the TV into a cheap power strip that has surge protection. The junk power strips can go bad and cause situations that can damage your TV. To see if it is the cord or power strip issue, plug it directly into a wall socket. If all this is okay, the most likely issue is the power supply board in the TV. You can find them online and even on Amazon for cheap. Also be sure the issue is not with the TV input where the plug attaches into. If you do decide to change the power supply board, the instructions will be with it and YouTube videos can give you even better instructions to remove and replace. Here are Dynex TV parts. Previous post: Maytag Refrigerator Water Filters – How Often To Replace Filter? Next post: What To Do If An Electrical Breaker Keeps Tripping In Your Home?